The second season of Gotham is underway, and the show has found new life with a faster pace, more character work, and a focus on longer story arcs that play with the serialized nature of the show. Both cast and crew have been quick to point out the latter; as they think it has improved the show. That was the centerpiece of an extensive conversation ComicBook.com had with Bruno Heller, the showrunner of Gotham. After the season premiere that established the new status quo, we talked with Heller about the new tone of the show, and the challenges – good and bad – of working with the huge and varied DC Comics mythology. We’ve already run the part of the conversation from last week where Heller told us that the Court of Owls, a relatively new addition to DC mythos, is on their way to Gotham, but here is the rest of the talk in full, and why he thinks the show is “more Gotham” than season one was. I’ve heard from a couple of your actors, especially Drew Powell who has worked with you before, that season two feels much more like it’s a “Bruno Heller” show. Do you agree, and if so, why do you think that is? Bruno Heller: I don’t know about a Bruno Heller show, but on a show with the scope and ambition that we started with on this show, it takes some time. To put it another way, everyone has a plan until the first punch is thrown, and then you’re reacting. With a show like this, the first season is very much a shakeout of what works and what doesn’t, and how to tell these stories. It’s not a procedural show where you take a formula to start with, and the formula works and you just repeat it. This second season is very much more focused, and playing to what we discovered the strengths of the show are. 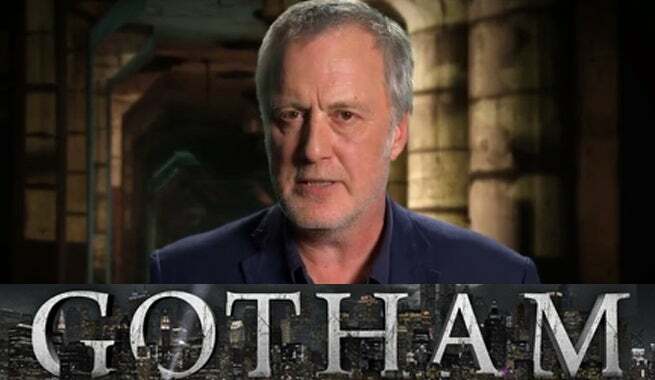 In that sense, it’s not more “Bruno Heller,” it’s more “Gotham.” Certainly, I feel we are much more in control of the storytelling this season, because we know how to tell the stories, what the rhythm of the show is, what the best aspects of the characters are, and what’s fun to do. We know what doesn’t play as well, also. We’re very thankful and blessed to have a second season. Everyone starts feeling at home and the actors own their characters; it’s much easier to write to the people as opposed to writing a general sense of the character. Now we know who they are and what their strengths are. To a degree on the contrary, season two is much more of a collaborate effort. There’s much more input from the actors, there’s more director’s input into it, and it’s everyone working together. Very interesting. Likewise, when I was on set a couple of weeks ago, the cast universally agreed that the season 2 premiere was virtually a second pilot. After you seemed to get the serialized nature during those last four episodes of season one where you really expanded the story; what about it worked so well that you wanted to carry over into season 2? BH: Yeah, it’s as much learning from mistakes as it is learning from successes. We realized that we had to - season one had so many great stories to tell, and we tried to tell too many stories. This season, we’re able to sharpen the focus. It’s almost just a matter of airtime! People need to live in the stories for longer. You need to pay far more attention to the emotional weight of storylines instead of just going through a checklist. The other side of it, it’s true, every season will start with an episode that feels like the pilot, the start of a new era, because that’s the epic scale of the story that we’re telling. There are so many momentous, mythical things that happen to these characters that you have to take it that way. To a degree, the speed at which modern drama burns through story is antithetical to telling this kind of mythic, historic, epic story. We need to take a step back and give the stories the weight that they really need. Mythology is a very different kind of storytelling from pure fiction, if you can make that distinction between them. Pure invention, which to a degree is most shows, you’re introducing characters you haven’t met before. With these stories, it’s like telling someone stories about their mum and dad. It’s your own family. So you need to give the emotional weight with that kind of familiarity and closeness and passion that people have for these characters. You need to give them the weight that expectation deserves. That’s really what we learned about, working through the first season and into the second season. I was also told that the season is being split fairly evenly in two, at eleven episodes, then eleven episodes – is that just a functional split, or will we be introduced to a new storyarc in the spring? BH: Well, the whole season is one great story, but there’s a natural break. It’s like, I don’t know if you saw the original Lawrence of Arabia, but after episode 11, it’s sort of like the intermission. You can go get some candy at the concession stand and have a pee, and come back for the second half. There are suspenseful elements that will roll over into the second half of the season. Episode 11 has a very pleasing climax, but then also asks a lot of questions about the second half of the season. It’s the best of both worlds, I hope. There’s a lot of speculation by fans and by writers like myself about the show, about individual characters; what does that sort of conversation do for you? What do you think of all that? BH: It’s nothing but a blessing. It’s an honor and a privilege to work on something that already has such cultural weight. We’re both climbing on the backs of giants and trying to live up to the epic scale of storytelling that has gone before us. The beautiful thing about a show like this is that it’s part of a much longer conversation that will go on long after the show is gone. Batman and the DC mythology, and that universe will live on. So to a degree, good or bad, it’s a privilege just to be part of that conversation. I listen to what everyone says with as much humility as possible. Nobody on this show, least of all me, owns these creations. We’re borrowing, being allowed to play with these wonderful characters and wonderful storylines. Everyone’s opinion is legitimate and has been valid and has to be listened to. That’s one of those skills in my particular job that you have to learn early and well: You’re not writing poetry for yourself. You’re not even writing movies where, once you’ve done it, you present it to the audience and walk away. Here, it’s very much about the interplay between what we’re doing and what the audience would like to see, and how they react. So we listen intensely to what the audience is saying, because it’s a very engaged and knowledgeable audience. We would be foolish to dismiss criticisms as being off the reservation, because it’s all about the audience. The joy of working in this area where you really feel you’re part of this communal theater, you’re creating it with the audience, that’s the best part of TV. You’re constantly engaged, you don’t just put it out there and hope for the best.